The Snare drum is known as one of the most important drums in your kit. Some cal lit the heart of the drum set, as most beats are based around the timing of the snare drum. Snare drums are made just like any other drum; however, locate on the bottom skin (resonant), there is a group or wires that are spread across the head. This is called the snare. These wires are small and curly, and when placed on the drum, give it a totally different sound. Snare drums are usually built thinner than most other drums, and can be made from wood, brass, steel, or aluminum. 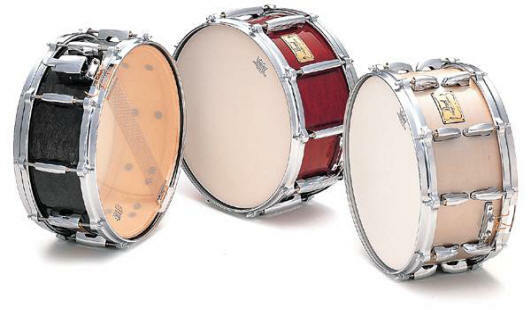 Although the most common sizes for a snare are usually around 5x14, they can be made in all different sizes. Some of these different effect snares are: Popcorn snare, Firecracker snare, and Piccolo snare. The snare drum can be used for two different drum sounds, snared and unsnared. The snared sound is played 90% of the time, and offers a cracking sound. The unsnared sound is just like a regular tom with a high pitch. Because of the shortness of the drum, there is usually very little sustain in the tone. A snare drum is a very personally part of your drum kit. Changing your stock snare drum is not uncommon, as most people like to personalize their sound by introducing a new snare to the mix.